Lunch Set Menu from £10.95 Per Person at Loch Fyne Seafood and Grill Pop down to your local Loch Fyne for lunch and enjoy a delicious set menu from just £10.95! Evening Deal £15.95 for a Main & Glass of Wine at Loch Fyne Seafood and Grill Enjoy a main and wine for just £15.95 at Loch Fyne. Valid Sunday – Thursday, from 6pm! Kids Eat Free at Loch Fyne Seafood and Grill Feed your little tiddlers for free at Loch Fyne Seafood and Grill today! 2 for 1 Cocktails at Loch Fyne Seafood and Grill Valid Sunday – Thursday 12 noon-7pm, Friday – Saturday 5pm-7pm only! Complimentary Side with Lunch Set Menu Orders at Loch Fyne Seafood and Grill Order from the lunch set menu and enjoy a cheeky side for free at Loch Fyne Seafood and Grill! Gluten Free Menu Available at Loch Fyne Seafood and Grill No need to go without due to dietary restrictions at Loch Fyne. Check out their gluten free options now. Kids 2 Course Menu for £7 or 3 Courses for £9 at Loch Fyne Seafood and Grill Don't miss out on this super deal to feed the nippers at Loch Fyne Seafood and Grill! Complimentary Glass of Champagne with Friend of Loch Fyne Sign-Ups at Loch Fyne Seafood and Grill Make a great meal better when you sign up at Loch Fyne! Mussel Madness - Mussels & Drink for £17 on Tuesdays at Loch Fyne Seafood and Grill Valid after 6 pm only! 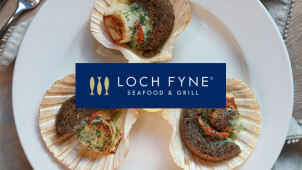 £10 Off with Newsletter Sign-Ups at Loch Fyne Seafood and Grill Enjoy great food for less when you sign up to Loch Fyne's newsletter! Not only can you order a la carte at Loch Fyne but you can also choose between 2 and 3-course set meals and of course, it always pays to go online and book a table. Being such a popular spot for foodies travelling to the UK from around the world, it pays to book ahead. Also, make sure to bring along your Loch Fyne discount codes. You will also find that there are great selections on the children’s menu and that there are even superbly delicious breakfast offerings as well. The Loch Fyne website gives a list of locations to choose from when travelling around the UK and if you book online you’ll be sure to have a table reserved even if a local event has tables booked up for the night. If you can’t be with a special friend or family member on their birthday, why not give a Loch Fyne gift card you can have it personalised with a special message written by you just for them. This is one very special group of restaurants that goes above and beyond with the services they have to offer. How do I use my Loch Fyne voucher? Choose the deal you’d like to try and click on the View Deal button. Here is where you’ll get a voucher code or coupon if one is needed but sometimes you’ll simply be directed to Loch Fyne website. Be aware of the expiration dates so as to use your voucher code timely when clicking through. If the latest deal is a printable voucher, you’ll find when clicking through to view the deal so make sure to print them and have them handy to take along when you visit one of the delightful Loch Fyne locations. In addition to vouchers and discount codes you’ll find with us here on vouchercloud, you can also sign up on the Loch Fyne website to receive a coupon for £10 off your next visit. Also, why not become a friend and receive 10% off food when you dine at any of the Loch Fyne locations. These extra perks make it nice when you want a night of fine dining, great wine and atmosphere you’ll only find at Loch Fyne. Where can I view the Loch Fyne menu online? If you visit the Loch Fyne website you can find an extensive online menu beginning on this page. From there you will be directed to the menu of your choice so that you can browse through the offerings. Here you will find the a la carte menu, the set menu for 2 or 3 course meals, a breakfast menu and even the children’s menu. Click on the menu you’d like to view and you will be taken to a page where you can view each in its entirety. Where is the nearest Loch Fyne? Since there are 24 locations throughout the UK at this time, you should have no difficulties finding one near you. This is where you’ll find all the Loch Fyne locations listed. Is Loch Fyne suitable for vegans/vegetarians? While much of the fare at Loch Fyne is seafood, there are menu items that are well-suited for vegetarians. It would be well to take a few moments to view the various menus to see what is available, but there are such items as the Baked Goat's Cheese Crottin that is absolutely delicious and perfect for those who don’t eat seafood or meat. Do I need to book a table for Loch Fyne in advance? Loch Fyne is extremely popular so it is suggested that you book in advance for the location you are going to visit. You can select your location from a drop down menu and from there you will be required to select a session, the number of adults and children and other pertinent information. Book a table on here. Contact Loch Fyne using the online guest form. Opening times may vary, but you can check your local Loch Fyne here. For serious foodies who are into locally sourced seafood served in style, in an atmosphere that sets this restaurant apart from all others, Loch Fyne Seafood & Grill is a must. Relax, your budget is taken care if when you book your table with a Loch Fyne voucher. After all, what could be better than freshly caught seafood from the lochs of Scotland accompanied by fine wine - all for budget bill total at the end? Take a look at our available offers today. Loch Fyne now has 37 locations throughout the UK and each one prides itself on a passionate love of delectable locally sourced seafood, fine wine hand chosen by select experts and unique ambiance in which to dine. It all started with that very first restaurant back in 1998 that was the natural progression from a single sea shack that gained so much in popularity that there was no other recourse but to expand. Since each dish is more delightful than the next, we’d like to suggest some of the Loch Fyne favourites such as the Hawaiian Tuna Sushi Bowl for starters, followed by the a la carte Shellfish Platter with your choice of either Whole Crab or Lobster. Our Loch Fyne offers give you the excuse to go all out, without worrying about the bill at the end. If you’ve a taste for something from the land rather than the sea, sink your teeth into the 28 Day Aged Rib-Eye Steak. If you can’t decide, these would be our picks.